This page gives some details on the validatorsearch.verisignlabs.com DNSSEC outage that began on September 10, 2013, lasting until around March 22, 2018. In reality, DNS responses contain expired RRSIGs which are different from missing RRSIGs, though both are a common source of DNSSEC failures. dnscheck.iis.se archived this validatorsearch.verisignlabs.com DNSSEC outage. 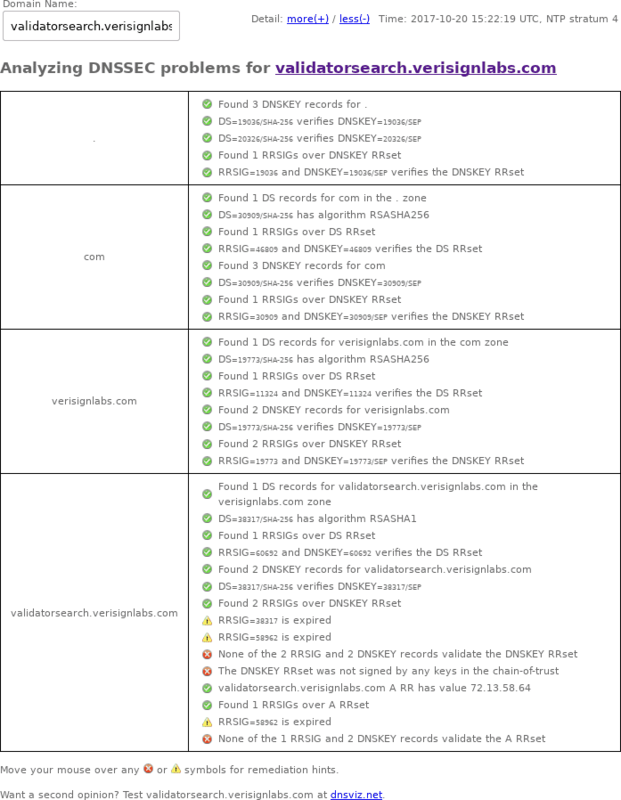 dnscheck.labs.nic.cz also archived this validatorsearch.verisignlabs.com DNSSEC outage. zonemaster.net archived this validatorsearch.verisignlabs.com DNSSEC outage, noting "Delegation from parent to child is not properly signed (signature: DNSSEC signature has expired)." zonemaster.fr archived this validatorsearch.verisignlabs.com DNSSEC outage, noting "Delegation from parent to child is not properly signed (signature: DNSSEC signature has expired)."